I have to say how honoured I have been to create music for such a huge number of clients over the years, and I am so proud of them all. I see the creation of the music and the floor plans for my riders as being the other part of their team. My clients school their horses, practice and then compete their Freestyles, I create their floor plans and music, we work together to achieve a common goal. This includes giving and feeling Joy as well as the Competitive Spirit. Win or not, I am equally proud of you all. Dressage to Music is not just putting music together for a test, it is creating a performance which evokes emotion, beauty and pleasure. So to all my clients, thank you. You give ME joy. Gaynor Colbourn is a very well respected session musician, concert performer, composer for Film and Television, Musical Theatre, as well as a Grand Prix Dressage Rider/Trainer herself who has brought her talents tirelessly to the dressage arena since 1980, when she first worked with GB Olympic Star, Jennie Loriston-Clarke MBE. This marked the origins of Dressage to Music as we know it today, and without her relentless clinics, demos, seminars throughout the following years, the Dancing horses of London 2012 would never have happened. As a Celebration of that first ever Demonstration at Wellington Riding on October 27th, 1980, Jennie and Gaynor are working together again on February 23rd at Wellington Riding. This is a tribute to 39 years of continuous dedication to Dressage to Music, and will feature several of the top horses from Catherston Stud, descendants of Dutch Courage, and Jennie's daughter, International Grand Prix Rider Lizzie Murray, and grand daughter, International Grand Prix Rider Charlotte Dicker. Gaynor's statistics are staggering with a colossal 10,515 reported winners worldwide, 3375 2nd places, and 3058 3rd places since she popularised Dressage to Music with Jennie Loriston-Clarke in 1980. Winners in 2018 414 wins, 14 UK Freestyle Champions, 5 Australian Champions, 14 International Winners. She has been asked to create Freestyle Music for 3 Nations so far for the 2020 Olympics, and another Nation for Para. Gaynor doesn't only create music for British and European Riders, she has a very large International Clientele. This video is Australian Star, Justine Greer, one of the large number of International riders who use Gaynor's music, winning her Inter 1 Class at Australia's DRESSAGE WITH THE STARS on Jaybee Cavalier March 24th 2018. Several Australian leading Australian Riders also use Gaynor's music. Rachelle Wilson and Charlie Welsh, who have both won every competition they have competed in using Gaynor's music, and Under 25's GP Rider Jorjia Adams who competes Internationally with Gaynor's music. Gaynor's ability to play any style of music comes from years of working with top recording artists of all styles, and coming from a family who encouraged her to play all styles from a very early age. She started piano lessons at age 2, and has never stopped loving playing. Her classical training, and work as a session musician ensures her clients have tailor made unique floorplans and dressage music in any style or genre with which they can enjoy and compete at the very highest of levels. Her simply huge number of winners is due to her love of the sport she created so many years ago, the delight she gets from the joy that she gives to all the riders in both clinics, and competition music, and the gradual progress from the beginnings in 1980 which Dressage to Music is making as a bona-fide sport. Over the years Gaynor has been creating bespoke Music for Dressage, she has had 10,496 winners around the world, making her probably the Worlds most successful producer of music for dressage. Not to mention 2nds, 3rds, etc. 2018 was just as successful with 92% of her clients winning. 7 National Champions in one week in Septemper 2018, 5 Grand Prix winners in week one of October 2018! She is always very proud of her riders, winning or not, and feels that the creation of Tailor Made music should be accessible for all riders, so this is not a money making exercise for her, she merely covers what it costs to produce the music for anyone. Most of her Dressage to Music Galas are in aid of charity, so her work is very philanthropic. 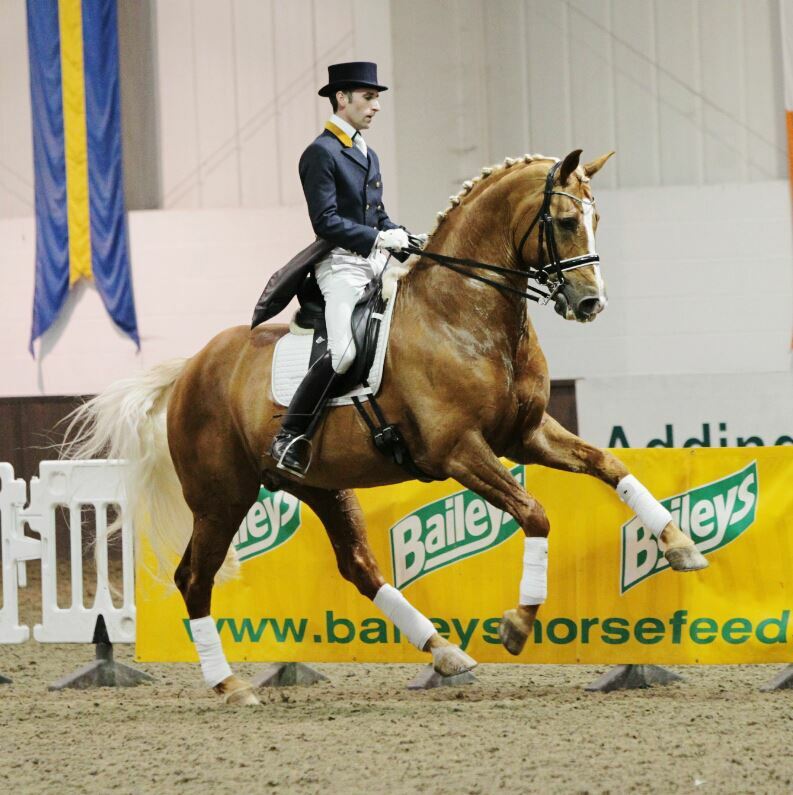 GB International Rider and Trainer, Luke Baber-Davies riding his home bred Disaronna, who he has trained, performing to music created by Gaynor at her Hascombe Gala Evening of Dressage to music. Katrina Cantrell riding Woodlander Donna Summer to a beautiful arrangement created by Gaynor of music from Les Miserable. Melissa Beer riding Guardadamas at Gaynor's West Sussex Demo, to music both composed and performed by her. Laura Woodcock, International Rider at Gaynor's Durham Demo. Katharine Lewis and her Fresian Stallion Joss K won both the Elemetary and Medium Summer Freestyle Championships with music composed by Gaynor, from her very successful musical, The Fire of London, composed with Perryn Butler. How Gaynor started in Dressage to Music. I have been involved in Dressage to Music from 1980, when I started working with Jennie Loriston-Clarke at the sport’s inception. As a trained classical musician, composer and session musician in the recording and TV/Film world, and rider, the two skills seemed to be destined to merge. The initial idea came about when having dinner with John and Nereide Goodman, the owners of Wellington Riding in Heckfied. Their grand piano was conveniently situated near the television, when the Goodwood Grand Prix Special was being shown with the sound turned off. I was happily playing piano to the horses, in a way which was reminiscent of the silent movie films music. The rest is literally history, I met Jennie and our first joint venture was a superb demonstration of Dressage to Music at Wellington Riding, with Jennie riding the mighty Dutch Courage, a young Dutch Gold then working at Advanced Medium, and Benjamin Bunny. Neirede Goodman rode Wellington Oliver in a beautiful Pas De Deux with Jeremy Michaels, her chief instructor on a lovely chestnut, whose name escapes me. I produced music for all the demonstration, and developed my trademark style of playing keyboards live in the arena, matching every move, tempo, change, and yes, even the odd shy and buck. Gaynor has said that the shere variety of music she is asked to do is astounding, with music from all genres, old, new, classical, rock, folk, metal, musicals. reggae------- the list just goes on and on. Gaynor always makes her music foot tapping, fun, individual and most of all, tailor made in every way to the horse and the test. Judges can see music in harmony with the test, and the audiences love the drama and emotion put into the tests. Gaynor always approaches the music for her clients in a way which gets the most exciting experience for everyone, she is always pleased when clients say that the Freestyle made people cry. That means she achieves results on an emotional level as well as producing music that looks good in competition or demonstration. Gaynor is a professional musician with over 38 years of producing tailor made WINNING competition music for hundreds of riders worldwide and several of the World's leading Dressage Riders. Tailor-Made unique Competition CD's for all levels, any style or type of music. Unique music created specifically to suit you and your horse, their tempos, personality, with absolute precision with transitions, extensions, lateral work, giving light and shade dynamics throughout your Freestyle.This is key to achieving fantastic artistic marks, and Gaynor's music and floorplans score on average 8's and 9's, with more than a handful of perfect 10's! The average score for Gaynor's clients is over 80%, so you know you are in safe hands. Her music is NOT ripped from a library of cover music, it is created from scratch, instrument by instrument, in Gaynor's recording studio. She can even produce the music on a specific instrument, or in a specific style if you want. Her music is NOT produced using music software such as Protools, Logic or Cubase, then patch and pasted. As a highly skilled composer and recording musician, the music is played from scratch, on each and every instrument, as one piece of flowing music. Judges love Gaynor's toe tapping, lively music.